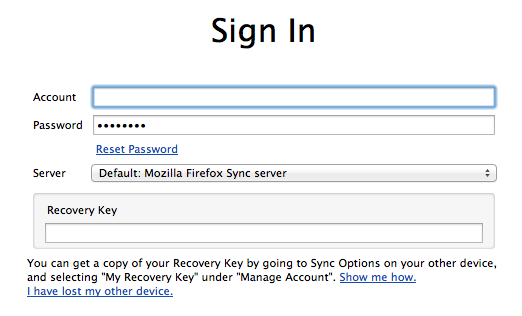 So I was setting up Firefox Sync, having used Google Sync for a while its nice. On the first device no problem, then I move to the second device, which is not with me. Fire up sync, and I see the best option is "I Don't Have the Device with Me"
What? I need the recovery key? From the other device? But if I have the other device, then why would I click "I Don't Have the Device with Me"??? So I have to click "lost my other device"? I use lastpass for password sync, it works between firefox and chrome. I use xmarks, acquired by lastpass, for bookmark sync. Of late I am moving to chrome and multiple profiles, using xmarks and lastpass to sync bookmarks and passwords but isolation of logins as I use Google at work and several accounts at home.